Mutianyu section of the great wall has the largest construction scale and provides spectacular views on either side. 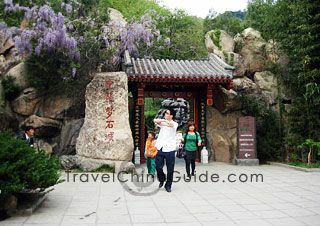 In the morning our guide will pick you up at the lobby of your hotel and accompany you to Mutianyu with private transfer. During the 2 hours driving, our professional guide will give you an explication of the Great Wall and the related Chinese history and culture. Upon arrival, you will begin walking up to the wall escorted by our guide. It will be a great workout, but all your hiking effort will be rewarded with the fantastic scenery. Lunch is not included and you can take along some food or snack. After that, we will drive back to your hotel. Meals: not included, but our guide will offer some suggestions. For those clients who are of adventure spirits, we also would like to offer the following detailed information for independent hiking on Mutianyu Great Wall. 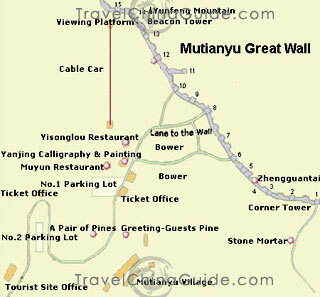 Highlights: Mutianyu Great Wall is 73 kilometers (45.4 miles) away from the city center of Beijing in Huairou District. It connects Juyongguan on the west and Gubeikou on the east. The section that is open to tourists is about 2,250 meters (2,460 yards) long and is equipped with a world-class cable car, the first built on the Great Wall. 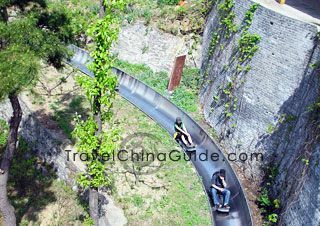 The China Dream Stones City, Lu Ming Recreation Zoo and the Slide Way are newly established to provide more options to visitors coming to Mutianyu. Mutianyu is accessible by taking a direct bus No. 867 at Dongzhimen station. The journey takes about 2.5 hours and the bus fare is CNY 16 in cash or CNY 6.4 with a transportation card. Please note that the bus is only available from March 15th to November 15th every year, and it leaves Dongzhimen at 07:00 hrs and 08:30 hrs and returns to the city at 14:00 hrs and 16:00 hrs. Alternatively, use bus No. 916 or 916 (express) from Dongzhimen Station and alight at Huairou Beidajie. Then take a cab or minibus to the attraction at a cost of CNY 50 per cab. Bus No. 916 runs from 5:30-18:00 at an interval of 20 minutes daily. The entrance fee is CNY45 per person. There are about 20 watchtowers along the section, numbered 1 to 20 from east to west. Being different from other sections, the paths along the wall are totally composed of steps. You may opt to take the cable car instead. Ticket price is CNY80 per person one way or CNY100 for a round trip. The cable car takes you up to No. 14 Watchtower directly. For those who are sporty enough to walk up the Great Wall, they can choose either the south or north passage. Each passage will have split ways half way up. The two fork ways of the south passage will take visitors to watchtowers No. 6 and No. 8 respectively; whereas the two of the north passage will lead to watchtowers No. 8 and No. 10 respectively. 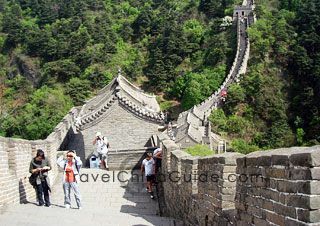 Visitors have to take the south passage route to visit all the 20 watchtowers. Along the way, one will first come across the China Dream Stones City, which has a collection of more than 20 thousand weird stones weighing up to 4,500 tons. There will be another split roads further on and visitors should use the right route to reach the No. 6 watchtower. There are signages indicating the number of steps to climb. 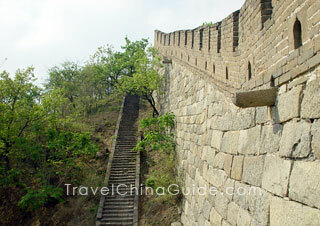 It takes about 30-40 minutes to climb thousands of steps to reach the Great Wall. The starting point of the zip wire down the mountain can be seen here. Also, take note of the differences between this great wall and others. There are battlements on the both sides of the wall, while others have it on one side. Whilst most of the Chinese great walls lie among the bold mountains, up to 90% of the areas around Mutianyu are forested. Hence, different sceneries can be appreciated in the four seasons. The wall is not high in altitude either but the views are stereoscopic. Climb eastwards from No. 6 to No. 4 Watchtower where the Mutianyu Pass is located. It is the lowest point of this wall with an altitude of only 486 meters (1,594 feet and composed of three connected terraces. Each terrace has a tower on top. What's more, the gate of the pass is not built on the middle but on the two side terraces. Walking eastward from the pass will take visitors to the No.1 Watchtower. This 500-meter-section is considered to be a steep part of the wall. Turning back and walk westward will lead to watchtower No.20. The section from watchtower No.5 to No. 20 is well preserved and the walkway is in good condition. Enjoy the pleasant scenery on both sides of the wall at your own pace. Breathe in the fresh air and enjoy the beautiful views. The steps from Watchtower 19 to 20 are rather steep, with an angle of up to 70 degrees. However, visitors will be on top of the wall once at tower 20. The next watchtower in front is the well-known collapsed Jiankou Great Wall. To descend the great wall, go to either Building No. 14 to take the cable car or No. 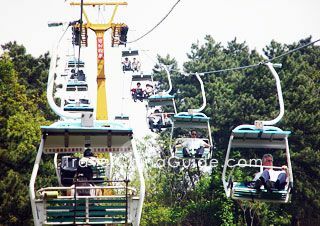 6 to take the zip wire at a cost of CNY 60 per person. Alternatively, walk down the wall. Take shuttle No. 916 (Express) or 867 back to Beijing. 1. Wearing long pants rather than shorts even in hot summer. You are going to walk through jungles to reach the wall; so long pants can protect your legs. 2. Toilets can be found near the ticket office, parking lot, visitor's center, and north entrance. Along the wall, you can also find toilets near watchtowers 4, 8, and 14. Always remember to bring toilet paper with you! 3. Use Bus 916 (express) rather than 916, as the former one is one hour faster than the latter one, but the price is the same. 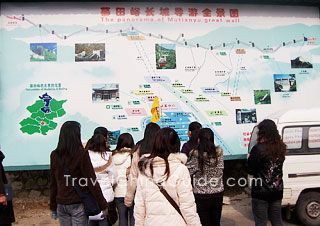 After getting off bus 916 (express), you need to take a cab or a minibus to Mutianyu. The minibuses are actually private cars which are operated illegally, but these are the only way to get to Mutianyu. Remember to bargain with the driver and the cost can be no more than CNY 50 per cab one way. Get down the mountain by 16:30 or it is not easy to find a minibus to get back to 916 bus station. 4. Take your time and get down the mountain by 16:00 to catch bus 876 back to the city. 5. Bus 867 and 916 (express) stop at different places at Dongzhimen. From Exit B of Dongzhimen subway station, walk eastward along the Dongzhimenwai Street for 218 yards (200 meters) you will find the bus stop of 916 and 916 (express). Continue to walk 109 yards (100 meters), turn left and go northward for 500 meters, you will find the 876 bus stop. he will arrive first at 5.15 am in the morning, and I will be arriving by 7 am, so which one is the best place for us to meet, after the exit door or still inside the terminal, as I am afraid it's so huge, so it would be difficult for me to meet my friend, I am suggesting to meet in Starbucks inside the terminal 3 before exit door, but I have no idea if there is one there. Your suggestion is highly appreciated . Yes, Starbucks is a nice landmark to be a meeting point. In T3, one is located at F3, Zone C. Upon landing, you can consult the staff and follow the English signs at the airport. Don't worry. 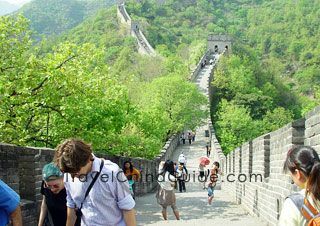 Hi, me and my husband will have 10hours in Beijing waiting for next flight and we would spend visiting Great Wall in Mutianyu and Ming Tombs. Do you think we should take a "green&yellow" taxi outside the capital airport? How much do they charge for this round trip? Can we negotiate with them? Some agencies have asked me CNY2190!! Do you think it's better change Dollars inside airport or at ATM? At first, you should reserve about 2 hours for transferring to the next flight. In my opinion, you are advised to hire a car and the fee is about CNY600-800 for round-trip and you can bargain with the driver. You are advised to change some Chinese currency at ATM. But have to remind you, the duration is about 4-5 hours for the car ride. So you may only have about 3-4 hours for sightseeing. 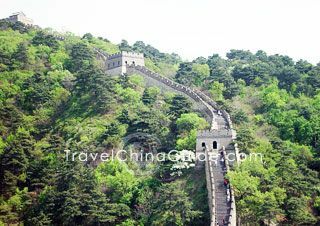 So you are advised to only visit the Great Wall and give up the Ming Tombs. Is it line 10 that pass Sunworld Dynasty Hotel Wangfujing. do we wait at normal bus stop? How long does it take to get to the airport? Can we book a seat in advance? You can first walk about 480 meters to the Dengshikou metro station to take the metro line 5 and get off at West Huixin Street. Then transfer to the metro line 10 and get off at Sanyuanqiao. Then go on take the airport line and get off at T3. The ride takes about 1hours and the tikcet fare is CNY29. You cannot book the seat in advance. How can i go to wangfujing street from capital international airport terminal 2? Shuttle bus line 3 can send you straight to the street!